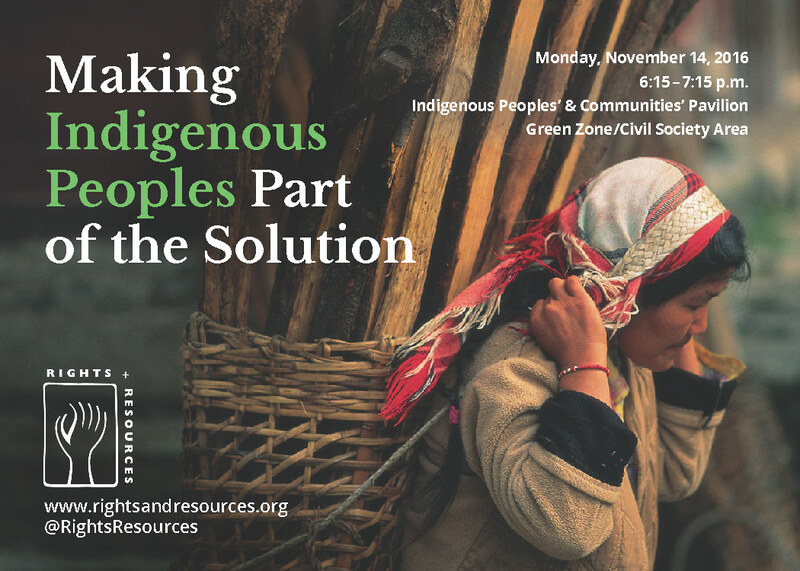 The panel will focus on the role and contributions of Indigenous Peoples and local communities in the global struggle to combat climate change. Special attention will be placed on locally adapted knowledge, management practices and technologies to strengthen the mitigation impact of Indigenous Peoples, policy and financing opportunities to strengthen resource rights, and partnership opportunities with government and private actors to further climate change mitigation and adaptation. As the primary custodians the world’s remaining tropical forests, Indigenous Peoples and local communities play a vital role in the protection of critically important ecosystems and the maintenance of forest carbon stocks in particular. A recent study of Intended Nationally Determined Contributions to climate change mitigation from 188 countries found that only 21 INDCs, representing less than 13 percent of the world’s tropical forests, included clear commitments to community-based tenure or natural resource management strategies as part of their plans. Building on prior research and new evidence from RRI, WHRC and WRI, showing that securing rights offers a commonsense solution to combating climate change, the panel of leaders will discuss challenges and opportunities to making climate interventions more effective.